People everywhere describe their relationships with brands of all kinds in deeply personal ways—we hate our banks, love our smartphones, and think the cable company is out to get us. What’s actually going on in our brains when we make these judgments? 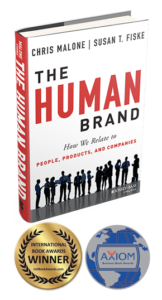 Through their original research, customer loyalty expert Chris Malone and social psychologist Susan Fiske show that we relate to companies, brands, and even inanimate products in the same way that we naturally perceive, judge, and behave toward one another. Early humans developed a kind of genius for making two specific kinds of quick judgments: What are the intentions of other people toward me? And how capable are they of carrying out those intentions? Social psychologists call these two categories of perception warmth and competence, and they drive most of our emotions and behavior toward other people—and in today’s modern world, toward businesses too. As a result, we become devoted to certain companies, brands, even products, but we also have high expectations for loyalty from them in return.